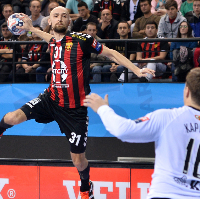 Europe’s top men’s club competition, the VELUX EHF Champions League, enters its winter break after 10 rounds and 140 matches, with the competition having generated more TV interest than ever before. 42 TV partners are broadcasting the competition to more than 80 territories this season, with worldwide coverage also guaranteed via the EHF’s own OTT platform, ehfTV.com. Matches involving the sport’s top stars and leading teams are attracting considerable interest not just in their home markets but also worldwide. There were a plethora of close and exciting matches – only 55% ended in victories for the home team, 34% for the away team and 11% draws. The most-watched match so far has been the encounter between two of the giants of European handball: Paris Saint-Germain Handball and HC Telekom Veszprém (Round 7), which was shown by 22 TV channels worldwide. There are new developments off the court too, with the number of partners and sponsors increasing from the start of the new season. Two new sponsors have joined as regional premium sponsors: Gorenje, the leading European home appliance manufacturer and one of Slovenia’s largest and most successful companies, in addition to Cashback World. The competition also has a new charity partner – Plan International – which has gained prominent exposure through the branding of the centre circle at each match so far this season. Through its latest ‘My dream is…’ campaign, the charity has sought to highlight the need for children in developing countries to have the same rights and opportunities as all children in the world. Sportradar, the global leader in data and digital content, joined as the ‘official streaming and data partner of the EHF club competitions’. In a first step this meant extensive live match statistics from all of the EHF’s club competitions for the first time from the start of the season. An official seasonal merchandising range was launched this season. Specially created by Salming, the official sports outfitter of the EHF Champions League, the range includes t-shirts and hoodies. The limited edition range is available to purchase online and has been designed with attitude and confidence to reflect the EHF Champions League brand. It is available to buy online. For the second year in a row, the VELUX EHF FINAL4 won a coveted award for its entertainment programme. The event won the ‘People’s Choice Award’ for the VELUX EHF FINAL4 2017 shows ‘Always Moving’ at the Bea World Festival. Play continues in the VELUX EHF Champions League from February 2018, after the next major highlight in international men’s handball, the Men’s EHF EURO 2018 in Croatia (12-28 January 2018). The final aim for every team is a place in the VELUX EHF FINAL4, which will be played on 26/27 May 2018 in Cologne’s LANXESS arena. Fans still have a chance to experience Europe’s most spectacular indoor sports event for themselves. The next batch of 400 tickets will go on sale on Friday, 8 December 2017 at 10:00 hrs.